Chris is one of sixteen comedians competing in the Lung Capacity game during the comedy show Weeding Out The Stoned at the Good Good Comedy Theatre. 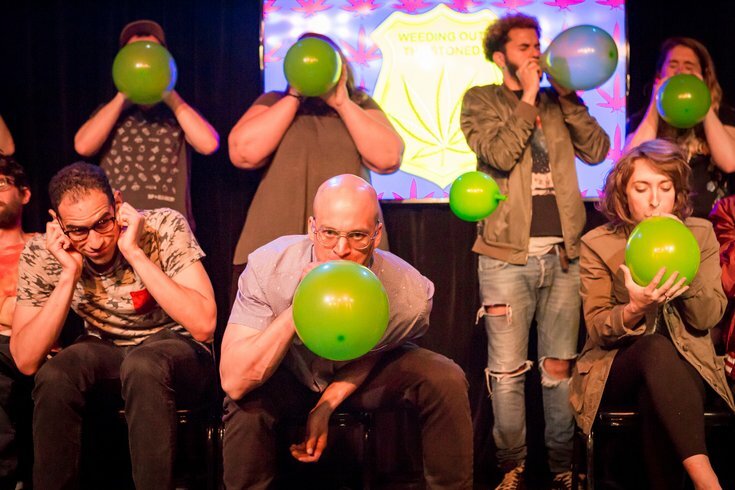 The game helps the audience determine the stoned comedians based on their ability to inflate and pop a balloon by mouth. It’s likely Philadelphia’s decriminalization of marijuana possession in 2014 has had both good and bad consequences. But there has also been at least one rib-tickling consequence. Since 2015, the second and fourth Fridays of every month have seen the staging of “Weeding Out the Stoned,” a THC-infused mashup of improv comedy and game show. Billed as “the game show of sobriety tests” and mounted at Chinatown’s Good Good Comedy Theatre, arguably the city’s hippest, most adventurous laugheteria, “Weeding Out” boasts a premise that no doubt has the late Philly police commissioner and mayor, Frank Rizzo—who once claimed pro-legalization supporters needed to have the “cobwebs” cleared from their brains--spinning in his grave. 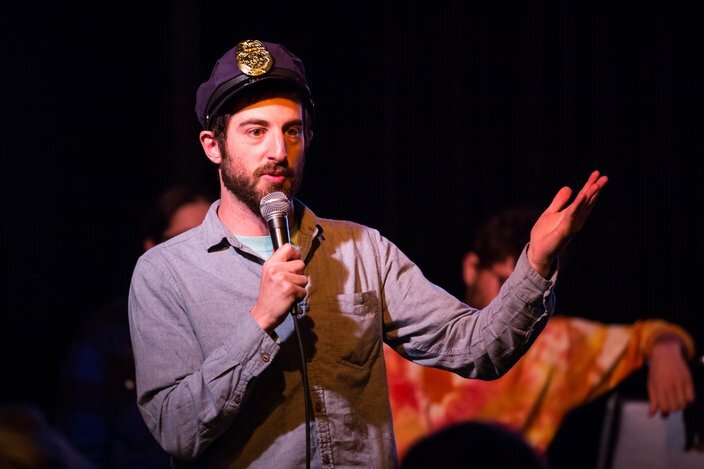 The brainchild of 31-year-old comedian Alex Grubard (who emcees in the guise of a police officer), “Weeding Out the Stoned” features 16 people—primarily members of Philly’s improv, sketch and/or standup comedy scenes—all but one of whom gets baked before the proceedings commence. Under Grubard’s direction, all are given various, challenging-to-the-weed-impaired, tasks through which the audience must determine the participant—a.k.a. the “narc”--who has not sparked up pre-show. This is where the comedy kicks in, as the 16 individuals provide instantaneous laughs (intended or not) attempting, among other things, to explain the meaning of life in 30 seconds, or to recite the alphabet backwards as quickly as possible. Michael, one of the final comedians remaining in Weeding Out The Stoned, attempts to sing “She's so high,' by Tal Bachman, (for the second time), Friday, May 11, 2018. There are physical challenges as well, including a test of lung capacity involving the inflating of balloons. A native New Yorker, Grubard grew up in Concord, Mass. and went to Temple University where, after two tries (he left after his freshman year to test the New York City stand-up waters), he graduated with a creative writing degree. He claimed “Weeding Out” did not come to him in a flash of creativity. Instead, he suggested, it was more organic, a byproduct of a lifestyle that included getting high with fellow comedians. “I don't even know,” he admitted when asked about the program’s genesis. “Obviously, I smoked.” But, he continued, the idea mainly grew out of him thinking about the ways comedians interact with each other and, of course, the role of weed in their lives. “I think, maybe, it came out of those comics' smoking circles, and wondering, ‘If we walked back into a show after [smoking dope], do you think anyone could tell who was sober out of the group?’” he said. “Weeding Out the Stoned,” which will next be presented this Friday, was actually one of several dozen concepts Grubard pitched for Good Good's “$5 Comedy Week,” a festival which showcases a variety of comedic concepts, with admission to all costing a single Abe Lincoln. It obviously was the right choice. 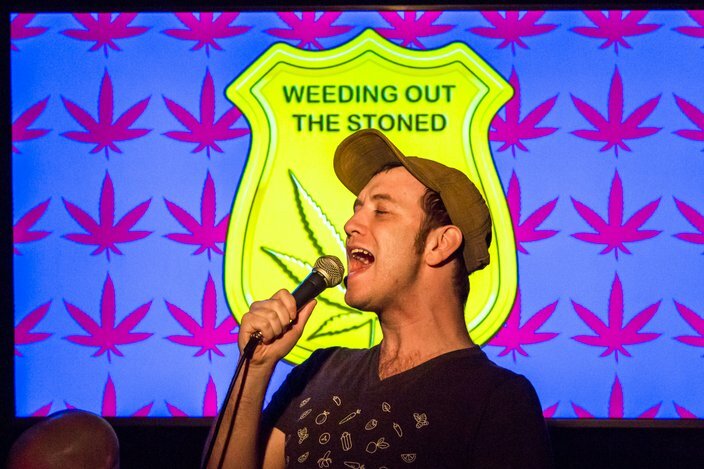 The host of the show, Alex Grubard, plays a cop and helps the audience in 'Weeding Out The Stoned' comedians. “‘Weeding Out the Stoned’ is one of our most popular shows,” said Kate Banford, co-owner of Good Good Comedy. “Weed and comedy are truly a perfect combination. Who knew? Banford’s partner, Aaron Nevins, noted that the added element of occasional participation by national-level comics makes the concept extra-special. “It’s been such a treat to have big surprise guests come on the show to act as the sheriff,” he offered. If you tell comics, ‘You need to be high for the show,’ they tend to figure it out." While changes in the law and District Attorney Larry Krasner’s mostly laissez-faire attitude toward simple use has made it seem there is de facto legalization in the city, technically, it is still a criminal—if not punishable-by-incarceration—offense to get high. But, according to Grubard, who will be taking “Weeding Out” to Jersey City, N.J., Wilmington, Del. and Cambridge, Mass. this spring and summer, his presentations are as law-abiding as a CYO dance. “Most of the time, people show up already good to go,” he reasoned. “If you tell comics, ‘You need to be high for the show,’ they tend to figure it out. We're not doing anything illegal [onstage]." Certainly, the show is not illegal nor, he added, anything that unusual. Catch the next "Weeding Out the Stoned" Friday, May 25 at Good Good Comedy, 215 N. 11th St. at 8:30 p.m.